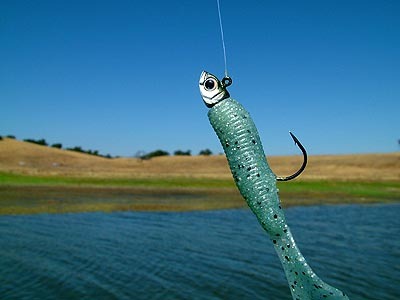 Introduction: While originally intended for coldwater bass fishing, new innovations in jig head fishing make it possible to utilize this technique successfully in a extensive range of conditions. Revenge Baits produces some of the most realistic dart jig heads on the market and are designed to help anglers deliver payback to those fish that might have "got away." Impressions: I have always enjoyed fishing with jigs due to their ability to target multiple depths with great accuracy. Most of my jig fishing has been done with typical lead dart or football heads. The purpose of these heads was primarily to weigh the attached lures down, and brandish the actual hook. While pure lead jig heads have proven to be effective, anglers can now add the extra element of a realistic looking dart head to their tackle cache. Revenge Baits produces a wide assortment of lures ranging from spinnerbaits to jigs, and the new Dart Hedz make it possible to add an extra level of realism to plastic presentations. When I first examined the Dart Hedz I couldn't help but notice the attention to detail in not just the profile of the heads, but the painting as well. While traditional jigheads are cone shaped the Dart Hedz are shaped like real baitfish, complete with a extruding gill plate. The Dart also features enlarged three dimensional eyes and a metallic pigment that shimmers in the sunlight, creating that extra flash. Finally there is a barb on the midsection of the jig head to hold rigged plastics securely in place. Real World Tests: I tested the Revenge Baits Dart Hedz with plastic paddle tail worms and single tail grubs on two local lakes. One of which offered crystal clear water, and another which was green with vegetation. Casting: Casting depends on a number of factors including the weight Dart Hedz you choose, the lb. test line you make use of, and the actual plastic you select to rig. While these lures can be used with baitcasting outfits, I had the most success finesse fishing with spinning gear. By using a spinning rod I was able to put smaller plastics on the heads and toss them a good distance when paired up with 8lb line. One of the key advantages of fishing with darts is the ability for pinpoint precision. I could cast the rigged Dart Hedz with great exactness. Because the Dart Hedz is rigged with an exposed hook this is not the technique you want to employ when in very weedy and heavily structured areas. Cast the rigged Dart Hedz over points, rocky drop off's, and deeply sunken structure, then begin one of various retrieve methods to bring the plastic to life. Retrieve: With the Dart Hedz you will find yourself doing a lot of casting and retrieving, and this lure is one of the better baits for covering large amounts of water quickly. I was pleased to see that even though the Dart Hedz was shaped like a fish it still maintained a very even and balanced retrieve. This also makes it easier to anticipate exactly where your lure is positioned in the water column. After the cast allow the lure to sink to your desired depth and begin applying action. Often times fish will zone in on the lure during the fall and commit to a strike. Always be prepared, as a strike often less like a tick and more akin to a slight tug. Anglers that desire to isolate targets will want to choose a plastic that is more buoyant, and exhibits a slower fall rate in the water, thus holding longer in the strike zone. The lure can be retrieved quickly in the water to generate reaction strikes, or search for fish, but I found that slower finesse techniques generated the greatest retort. Here is where the benefits of spinning gear really come into play. Once cast you can choose to swim the lure back or you can work the lure by either lifting the tip causing the lure to lurch forward then fall again, do this all the way back in. The second way to take advantage of spinning gear is to hold the rod securely and retrieve slowly as you shake the tip of the rod in a tight motion. Keep your line tense enough so the vibration translates all the way down your line and creates a fanatical dance below the surface. You can shake side to side or up and down, either way make sure to pause every so often. 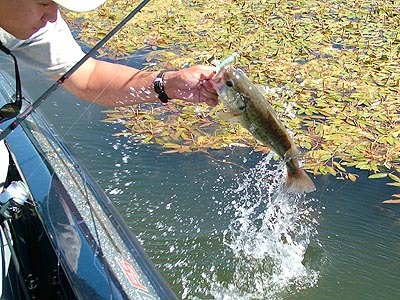 When bass strike it is often a subtle tug, so be ready to drive that hook. Often anglers will miss strikes because they are too occupied shivering their rods. Durability: The nice thing about tossing plain lead dart heads is that they are cheap and anglers usually don't feel all that much loss when they become damaged or are lost to structure. The Dart Hedz are more expensive than traditional jig heads, but they augment realism to your plastic presentations. The Dart Hedz are coated with a chip resistant coating that proved to be quite durable. We deliberately dragged the heads (unrigged) over rocky outcroppings and the lure sustained only minor scratches...no chips at all. At the end of our stress tests we rigged the head back up and found it just as effective as ever. The hook is the most likely to be damaged component, and can be bent if accidentally snagged on rocks. Applications: If you haven't fished with swimming grubs or dart rigged worms then you are missing out. This technique is proven effective in cold and clear water, but during our field tests we experienced a high level of success with the Revenge Dart Hedz even in warm murky water. This bait can be used to target both largemouth and bronzebacks with a assortment of retrieves. 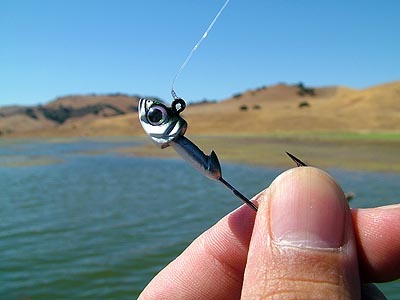 With just a little practice anglers can catch fish by dropping, swimming, darting, and shaking. Conclusion: Anglers usually make use of Texas and Carolina rigs more than anything else, but many have found that a swimming grub can also produce great results. 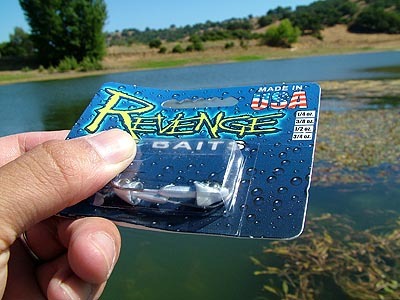 Revenge Baits Dart Hedz can be fished with many different techniques, but few anglers actually will employ them all. You can be quite successful by just mastering one or two of the techniques made possible with the Dart Hedz. These convincing looking dart heads did improve our total number of strikes, and the durable Mustad hooks stuck more fish than the low quality generic hooks found on most basic lead jig heads. When fishing pressure is at its highest the added realism of the Dart Hedz can make a difference in your catch, and maybe even help you exact revenge on that big fish that got away.